HHS cites data from the 2016 National Survey on Drug Use and Health to illustrate just how widespread the epidemic has become. In 2016, 116 people died every day from opioid-related drugs overdoses. In total, 42,249 people died from overdosing on opioids and an estimated 170,000 people tried heroin for the first time. The latter statistic points to the continuing nature of the crisis — more people starting to take lethal drugs means more overdose deaths later on. Because opioids are a form of prescription drugs, the Opioid Epidemic brings issues of medical malpractice front and center. Indeed, HHS estimates that 40 percent of opioid overdose deaths involve a prescription opioid. Imagine if 40 percent of car accident deaths could be traced back to a faulty airbag that was never recalled. Clearly you’d have a lawsuit on your hands. The same is happening now in the world of medical malpractice law. Medical malpractice involves a healthcare provider (doctor, hospital, etc.) causing injury to a patient as a result of negligence or omission. For a medical malpractice claim to be viable, it must show a violation of the standard of care. This “standard” of care refers to the accepted medical treatment that responsible doctors would take in the same circumstance. This is where medical malpractice law gets complicated as it relates to the Opioid Epidemic. After all, prescribing painkillers (opioids) is an incredibly common and standard practice in the field. 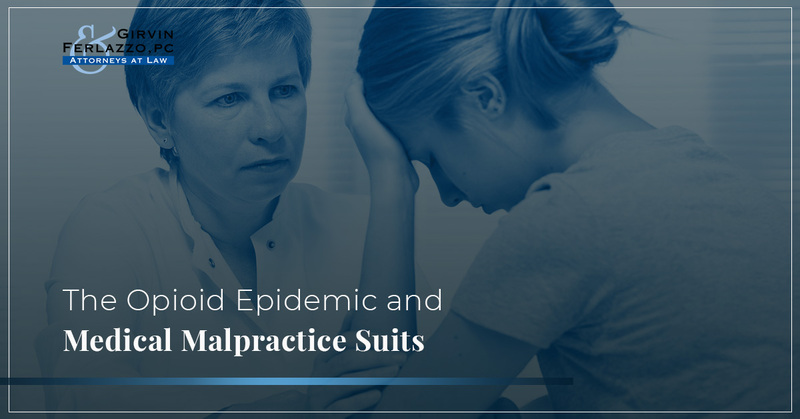 While this list is not comprehensive, it showcases the most relevant examples related to medical malpractice suits involve opioid addiction. The claim also hinges on whether the patient was injured. An opioid addiction and/or overdose death could certainly merit “injury” in this case. According to New York’s Opioid Annual Report published in October 2017, the age-adjusted rate of all opioid overdose deaths doubled between 2010 and 2015. If you or someone you love has dealt with opioid addiction that could be the result of medical malpractice, you should consult with a medical malpractice attorney as soon as possible. Call Girvin & Ferlazzo’s team of medical malpractice lawyers in Albany today.